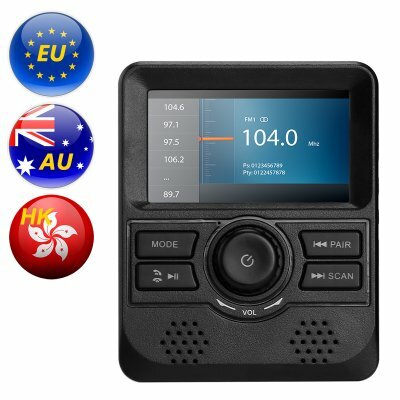 Successfully Added DAB Monitor - 3-Inch Display, FM Transmitter, Bluetooth, Aux Out, DAB Band III Frequency Range to your Shopping Cart. Use this digital audio broadcasting (DAB) monitor to take your car stereo to the next level. For those of you that are tired of listening to the same old songs over and over again, this DAB offers the perfect solution. With this car accessory, you’ll be able to access a wide-range of radio channels. Traditional FM frequencies are known to be slowly replaced digital audio broadcasting. Thanks to this cool gizmo, you’ll be able to enjoy all the benefits that this new technology has to offer. It comes with a 3.0-Inch LCD display that offers a convenient way to browse through the different available radio stations. Thanks to its universal design, this DAB monitor can be used with any car out there. Once installed, this car gadget treats you with a wide range of radio stations to choose from - far outnumbering those offered by your traditional FM radio. Additionally, it also supports Bluetooth connectivity. This lets you pair your car stereo with your smartphone and allows you to listen to all your favorite songs straight through your car’s speakers. While playing music, the monitor of this DAB system provides you with information on the artist, song, and more. With all this information at your disposal, you’ll never have to wonder again about the name of a catchy tune that you’ve once heard on the radio. Many cars with older model stereos do not support DAB. This is where your DAP monitor comes in handy as it lets you take your car to the 21st century. It will magnificently improve the music quality and lets you undergo a great audio experience whenever you’re driving your car. From now on, you’ll always be able to enjoy your favorite songs and talk shows in absolutely stunning quality. With its DAB Band III (174-240MHz) frequency range, you’ll have access to more songs than ever before. The device is easy to install and works through both audio cable and FM transmitter. This brings along great convenience while setting up your DAB car monitor. This DAB monitor comes with a 12 months warranty, brought to you by the leader in electronic devices as well as wholesale electronic gadgets..